On the night of September 7, 1996, Tupac Shakur and Suge Knight attended the Mike Tyson – Bruce Seldon boxing match at the MGM Grand in Las Vegas, Nevada. The actual “boxing match” lasted only 120 seconds but there was a second fight involving 2Pac and several members of his entourage in the lobby of the MGM Grand. 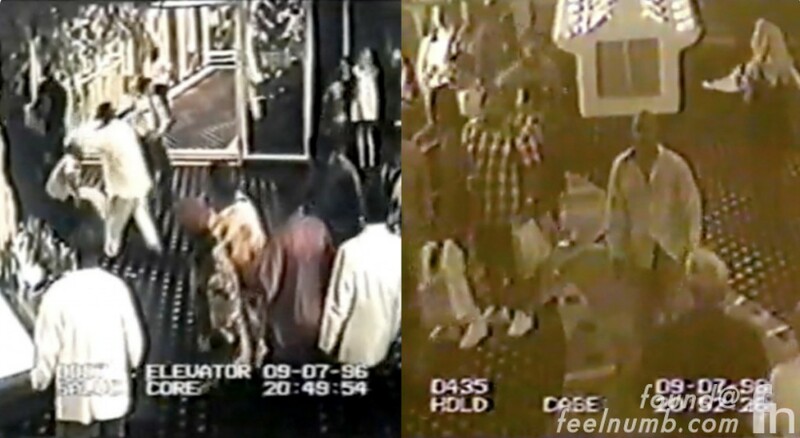 After the altercation, Pac and Suge made plans to hit up a club. They both change clothes and ride in Suge’s 1996 black BMW 750iL sedan followed by a larger convoy of cars filled with friends and bodyguards. 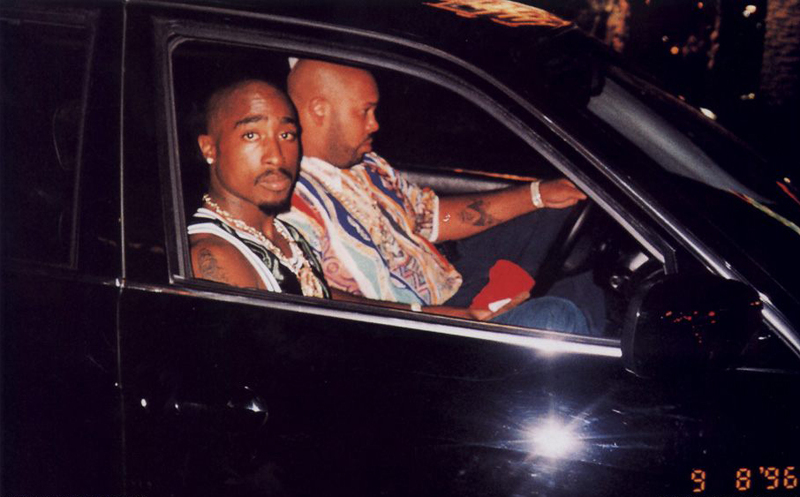 At 10:55 p.m., while paused at a red light, Tupac rolled down his window and a photographer took this photograph below. They were cruising down the strip bumping Pac’s “Makaveli” album when at 11:05 pm they were stopped for playing the stereo too loud and not displaying proper plates. 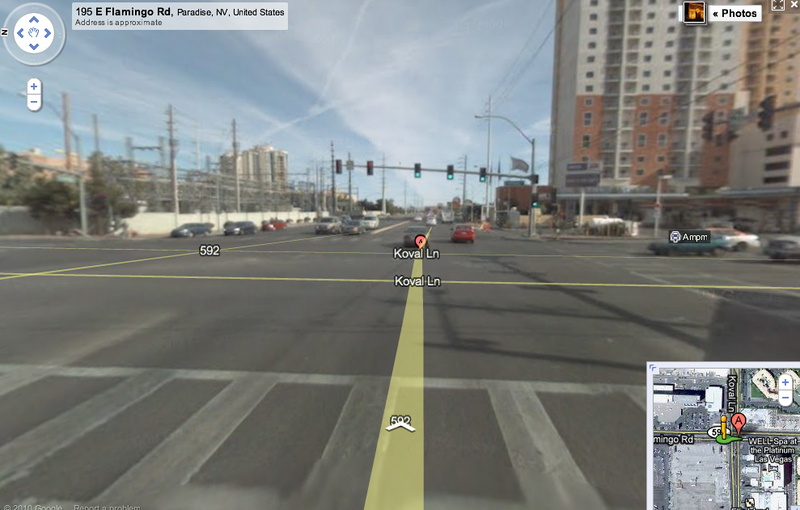 After they were let go by the cops, Suge and Tupac headed East on Flamingo Road where they stopped for a red light at Koval Lane, half mile from the Strip. At 11:15pm at this exact location below, a white 4-door cadillac with California plates rolls up to the passenger side of the BMW. According to one witness, two men got out of the Cadillac and fired 13 rounds from a Glock .40 caliber handgun at the BMW from less than 13 feet away. 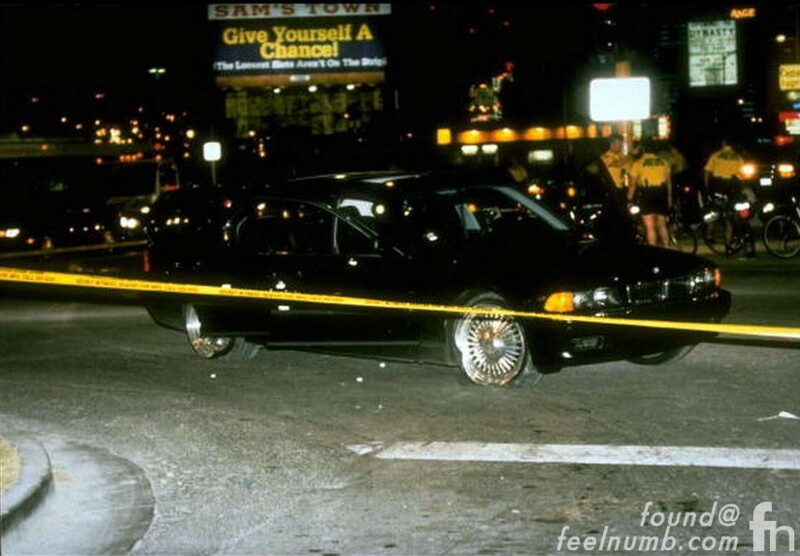 Tupac, sitting in the passenger side of the car, is hit three times, one striking his hip, another his right hand, with the fatal wound to his chest. According to the witness, Tupac attempted to jump into the back seat of the car as he is being shot but Suge pulls him down into the seat. Two tires are punctured in the barrage of gunfire. Suge suffers a minor wound to his head or neck. While in the critical care unit on the afternoon of September 13, 1996 (Friday the 13th), Tupac Shakur died of internal bleeding; doctors attempted to revive him but could not impede his hemorrhaging. His mother, Afeni, made the decision to tell the doctors to stop. He was pronounced dead at 4:03 p.m.
Free Music: John Frusciante Bonus Track "Here, Air"
"Neil Young" Covers Miley Cyrus' "Party In The U.S.A." & Willow Smith's "Whip My Hair"